I've been doing this one recently 4 x a day- each time that I take Sumo out morning and night, plus on the way back. The first few times I could tell immediately that I had neglected this key group for way too long- I felt extreme tightness back there that is now finally starting to show some improvement. The only difference for me is that I have found a curb with a wall directly in front for balance suppport, enabling me to stretch both legs at once. Does it ever feel good! If you are like most runners that neglects stretching, if nothing else get in the habit of stretching your calves and achilles. 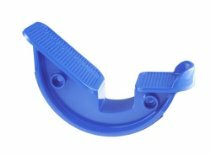 You can also purchase a single or double Pro Stretch device (pictured above) to keep handy at work or home so you use it regularly. Dave, these are great stretches--thanks for sharing. Do you know the RSS for your blog does not work? Although I am following you I do not get any updates. Hopefully you can get the RSS going-your posts are worth following!